A study investigating how musical emotion is perceived in older adults with hearing loss is underway at the SMART laboratory (Science of Music, Auditory Research and Technology), Ryerson University. Previous research in the SMART lab has found that older adults with hearing loss struggle to identify the emotion of speech. It seems that wearing hearing aids only increases the perceived amplitude of the signal, increasing participants’ arousal without improving emotion perception. Another study looking at music instead of speech found a similar situation, where hearing loss led to confusion as to what the emotion of the music was, and unfortunately hearing aids did not improve this. To shed light on this issue further, researchers at the SMART lab are conducting a study from October to December this year, that investigates emotion perception in music, and measuring physiological signals from the body to understand what is driving these differences in emotion. The binaural averages are taken at 500, 1000, 2000, and 4000 Hz, and all participants will have symmetrical hearing loss. The study involves participants sitting in a silent room at a computer and listening to segments of film music through speakers. The film music extracts range from orchestra pieces through solos of instruments, and represent one of four emotions (happy, tender, fearful or sad). The participants make ratings on the computer about how arousing/calming and how pleasant/unpleasant (the ‘valence’) the music segments are. There is also a second task where the participants choose which emotion label most accurately represents the music segments, as fast as they can. Whilst rating the emotion of the music segments, participants are connected to a system of sensors that monitors changes in emotion. This involves two sensors on the fingers that measure how aroused the participant is, four sensors on the face that measure muscle activity when smiling or frowning, a respiration belt around the chest to measure rate of breathing, and sensors attached to the wrist and ankle to measure heart rate (see the set-up on a happy participant below!). Figure 1. Participant ready to go for the test. 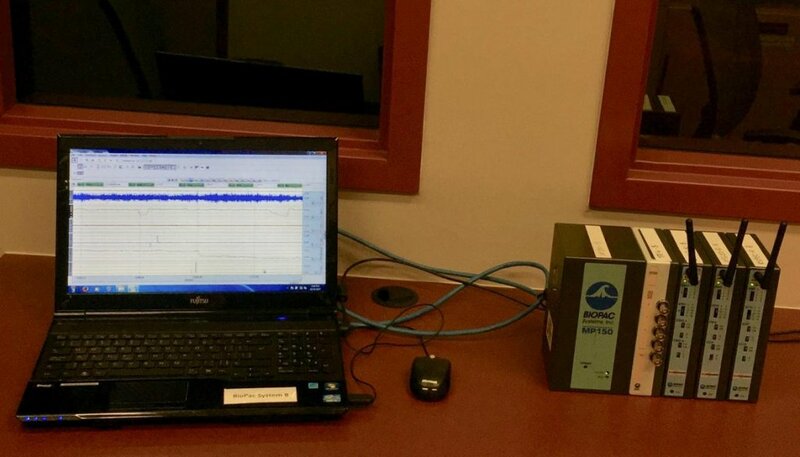 Sensors are connected wirelessly to a system located in another room, which the researcher monitors during the task. Changes in any of these signals can be mapped onto one of the four emotions mentioned above, and will indicate to the researchers what the participant is experiencing when listening to the emotional music (Figure 2). Figure 2. The receiving end of the wireless sensor system. The researchers are also collecting information on participants’ perception of their own hearing loss, satisfaction with hearing aids and absorption in music, to see if they have any influence on emotion perception in music. The researchers plan to compare the three groups on their emotion ratings, how accurate and how fast they were in identifying the emotion of the music segment, and the physiological reactions measured by the sensors. They expect to find results similar to the previous studies; that older adults with hearing loss are less accurate and slower at identifying the emotion in music, however the use of hearing aids will not restore accuracy to the ability of normal hearing adults. Most interestingly, the researchers expect the physiological signal from the body to show increased arousal for participants using hearing aids, as the aids increase the perceived amplitude of the music, unfortunately without improving their emotion identification. 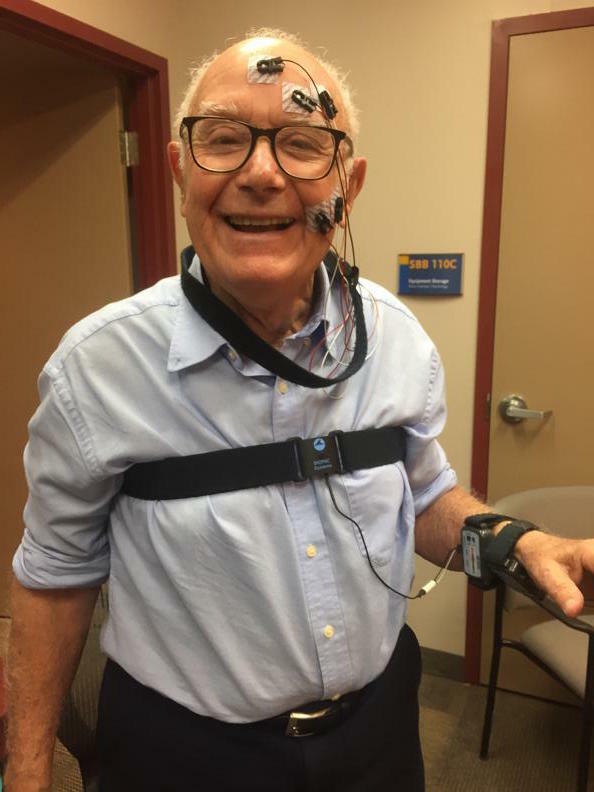 An exciting new finding the researchers are also expecting to find, is that participants with hearing loss will rate arousal and valence ratings in a narrower range (such as 3–7) compared to ratings of participants with hearing aids and normal hearing (such as 1–9). This has been found before with emotional sounds depending on the amplitude of the sound signal. Additionally, if this narrower range of ratings maps onto smaller changes in the physiological response from the body, this suggests hearing loss leads to a dampened physiological response, and a reduced emotional world, where it is harder to pick up on the subtle differences in emotion. The researchers’ goal is to uncover what it’s like to listen to music with hearing loss and whether hearing aids can improve this experience at all. In the long run, knowing how emotional responses differ according to hearing, and what is driving this, could help design a music program for hearing aids, so that listening to music can be an enjoyable experience for everyone. Emma is an undergraduate student in Psychology from the University of Surrey, England, joining the SMART lab at Ryerson in 2017 as a visiting research student. She is currently investigating physiological responses in older adults with hearing loss and hearing aids when listening to music, and brain oscillation activity during beat perception. Emma’s research interests are in auditory neuroscience, and in the long run she hopes to understand how machine intelligence and auditory perception interacts.